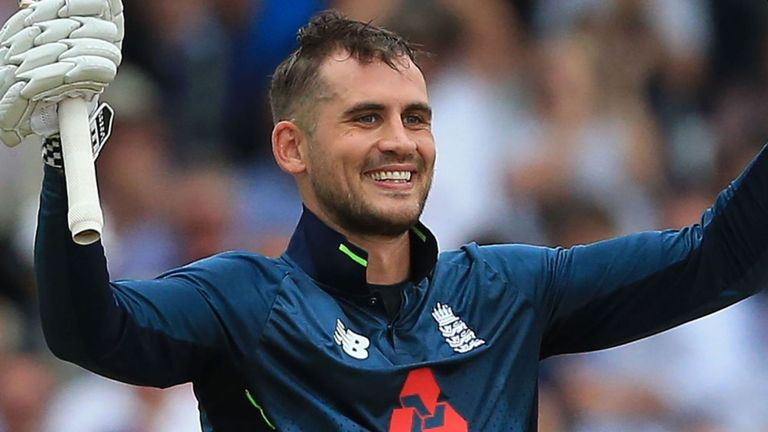 Alex Hales tells Saj (for Sky Sports) that England are rightly favourites for the World Cup - but that they must perform under pressure to win it. The batsman also discusses his experience in the Pakistan Super League and whether he could return to red-ball cricket in the future. It's a huge summer for English cricket, including the World Cup. Do you agree that England are the favourites for the competition? ALEX HALES: England are the favourites and that is based on what we have achieved in the last four years, which has been fantastic. That is why we are currently ranked the No 1 ODI team in the world. To not have lost a series in the last 10 ODI series shows that we are the in-form team. But as we saw in the last Champions Trophy anything can happen when it comes to knockout cricket. Hopefully if we play good cricket at the World Cup we will get through to the knockout stages and then it's all about how we perform under-pressure in those games. Hopefully we've learnt from our past experiences and can go all the way. Who do you see as the main challengers for England at the World Cup? AH: We all know that India are always a seriously strong team when it comes to World Cup tournaments. But with Pakistan you never quite know what Pakistan you are going to get. If they turn up, on their day they are an unbelievable team as we saw in the Champions Trophy, so nobody can rule them out. We also have Australia who by winning the recent series in India showed that they shouldn't be written off, especially if they have all their pacemen available and with David Warner and Steve Smith back in their ranks. So, I would say that England, India, Pakistan and Australia are the four main teams in the running to lift the World Cup. What are your thoughts on the format of this year's World Cup and the length of the tournament? AH: It's quite a long tournament but I quite like the idea of everyone playing each other once. I think the previous one was two groups and then quarter-finals, but I support the idea of everyone playing each other once. It's a slightly longer tournament this time around but it's a World Cup at the end of the day and it's a tournament that players dream of playing in when growing up. So, I won't criticise the format for the sake of an extra week or two as I do think it's a good one for the World Cup. How would you describe your international career to date? AH: I've really enjoyed it. If someone had said to me 10 years ago that I would play 140 games for my country I would have laughed in their face. To have achieved that with a few more to come is just amazing and it's been a hell of a ride. I have enjoyed every cap and every time I have put the England shirt on. Hopefully there are more to come. Is only playing 11 Test matches something you look back on with any regrets and could you perhaps have a change of heart and look to play Test cricket in future? AH: No, is the honest answer to that. I'm not playing red-ball cricket at the moment and it's certainly not something that is on my radar in the immediate future. England's openers have struggled in recent times in Test cricket. Why do you think that is and is it something that you see improving in the near future? AH: Hopefully the guys who have had a chance recently at the top of the order will come good soon. But it's important to appreciate that opening the batting in English conditions in red-ball cricket is probably the hardest job in the world of cricket. What we have seen of late is evidence of just how good the likes of Andrew Strauss, Alastair Cook and Marcus Trescothick were and they anchored that spot for such a long time. I think if these guys who have been given a chance recently at the top of the England order are given a long and fair run they will crack it. I can say through experience that opening the innings is a seriously tough job and it's about as hard as it gets in cricket. Hopefully the guys will get a fair crack and leave nothing in the tank. Should people be concerned about players giving up red-ball cricket and, in some people's views, chase the dollars of white-ball cricket around the world? AH: I don't think people should be concerned about the allure of white-ball cricket. There is no problem in my mind, as long as there are people attracted to the game and are watching cricket, and playing cricket as well, then that is brilliant. Life and things evolve, whatever happens in the next 20 years and as long as cricket grows as a sport then that's a good thing irrespective of whether that's with red-ball cricket or with white-ball cricket. If the game is attracting new people and thriving because of that, then that can only be a good thing. How was the recent experience of playing in the Pakistan Super League in Karachi? AH: It was very good and a memorable experience. This was the first time I have ever been to Pakistan and I was very impressed with the quality of the ground as well as the standard of cricket which was brilliant. The Pakistan Super League is renowned for its high-quality bowling attacks and looking around there was a lot of depth and class in every team's squad. I was only there for 48 hours or so but my time there was really enjoyable. My manager, my team-mates, the local players and the support you get from the fans and from social media really made me feel very welcome. The Prime Minister of Pakistan, Imran Khan, and other leading figures in the country have stated that they wish to host the entire Pakistan Super League in Pakistan next year. Would you play in the tournament if that was the case? AH: Yes, I would have no problems playing the full tournament in Pakistan provided everything was fine in terms of arrangements and I had the go-ahead security-wise. How was the atmosphere among the overseas players whilst you were in Karachi? AH: I only really spent most of my time at the hotel and the cricket ground and in terms of those two aspects, my stay there was most enjoyable. I was lucky enough to be around a good bunch of team-mates who I had played with in the previous year. All the players got along really well, and the experience was a memorable one although unfortunately I didn't get the chance to see a lot of the city of Karachi. Were you surprised and disappointed that you weren't picked for this season's Indian Premier League tournament? AH: To be honest, I never go into any auction expecting to be get picked-up for hundreds of thousands of dollars or pounds. The fact is that I've had limited experience over in India and limited success in that tournament. Having said that, I would have loved to have been a part of the IPL and been out there as it's a great tournament and all Twenty20 players around the world want to be involved in it. But now on the other hand I've got a quiet two to three weeks I can rest and train ahead of a big summer for English cricket, so I suppose it's really a win-win situation for me. Do you think limited-overs cricket is becoming too much in favour of the batting sides? AH: When it comes to high scores in 50-over cricket I think the Twenty20 format has a part to play in that when it comes to batting. Guys now have been playing 20-over cricket for 10 to 15 years and if you are constantly playing 20-over cricket and training for that you take that practice into the slightly longer format too. I think that's why we are seeing increased run-rates in 50-over cricket. As we move forward, bowlers are also coming up with new deliveries and are trying to adapt to the challenge of more aggressive batsmen. But I do think these high scores and higher run-rates are down to Twenty20 cricket, as it is becoming natural for batsmen to be more aggressive. What are the targets for Nottinghamshire this season? AH: The targets for the team each season are that just before the 50-over final we want to be challenging for all three competitions. I think we've made some really good signings obviously with Joe Clarke and Ben Duckett and obviously Zak Chappell from Leicestershire. In addition, Paul Coughlin looks like he will be fit this season and fingers-crossed they all will have big seasons. I also believe that signing James Pattinson again is huge. We had him at Nottinghamshire in 2017 and he is an unbelievable cricketer and one of the best I have played with. Also, we will have Stuart Broad available for quite a few County Championship matches so I would say that in terms of goals, we want to win one trophy, but realistically with the squad we have got I don't see why we cannot challenge in all three competitions. Looking ahead, where do you want to be as a cricketer in few years time? AH. Hopefully, I can be a World Cup winner which would be a nice start to the next couple of years. There are two World Cups in the next couple of years so my initial aim is to try and get into both of those squads and that would be a great achievement in itself given some of the talent we have got in English cricket at the moment, such as guys like James Vince who find themselves on the fringe but who is one hell of a player. If I get myself into the two World Cup squads and finish up with a medal, then let's see where we are at that point. I'm not someone who sets myself massive long term goals, but winning a World Cup medal would be outstanding and right up there.